At the beginning of her talk "Exploring Mars with Satellites" Dr Helen Walker commented that this was a special time for her employer, Rutherford Appleton Laboratories (RAL), as they were celebrating their 50th anniversary and they had just launched their 200th Earth-observing satellite. On a more personal note she has been involved in the field of satellite operations for many years. This included working on the Cluster spacecraft which was a set of four satellites that flew in formation to study the Earth's magnetosphere and they are currently still operational. She also worked for about 5 years on the Mars Express spacecraft that, as the name suggests, was placed in orbit around Mars and is still there studying the planet. At present she is involved with the development of an instrument called MIRI for the James Webb Space Telescope (JWST) which is the successor for the Hubble Space Telescope and has a provisional launch date of 2018. Dr Walker explained that over the many decades that spacecraft have visited our neighbouring planet the view of its past climate has changed radically. For in the 1970s the scientific consensus was that Mars had always been a dry and cold desert much like it is today. Ten years later and as more data was obtained the picture changed to a world with some water. Then after another decade or so of study the research pointed to a lot more water and today scientists believe that Mars could even have once had oceans and seas. However, in the present day all the water has either been lost to space or is frozen beneath the Martian surface. It is a dry and dusty world where the wind never ceases and is able to kick up the fine grains of sand into dust devils that stretch 20km up into the extremely thin atmosphere. As they travel across the planet's surface they reveal the dark soil underneath the top oxidized reddish layers. From orbit their chaotic meanderings appear almost like some abstract contemporary artwork that is influenced by the likes of Jackson Pollock. Sometimes these dust storms even grow to blanket the whole planet such as in 1971 when the spacecraft Mariner 9 arrived. The whole planet was enveloped in an orange haze with only the 24 km-high peak of the volcano Olympus Mons piercing the storm. This volcano holds the record for being the largest one in the Solar System and is thought to have grown so large due to the lack of tectonic activity on Mars. At one time it was thought to be extinct but now is classed as being (technically) dormant. 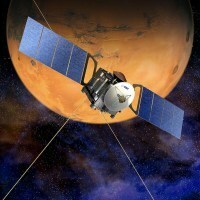 The latest spacecraft sent to investigate Mars is NASA's Mars Science Laboratory, more informally known as "Curiosity". It successfully landed in the equatorial Gale Crater on August 6th and its mission is to travel to the crater's central peak to investigate the sedimentary layering there. A team of orbiting satellites from ESA and NASA streamed data back to Earth as Curiosity began its descent and one satellite even managed to capture pictures of its descent and final landing position on the surface. This article was written for the club news column of the Stratford Herald. The actual lecture explained the subject at a deeper level.